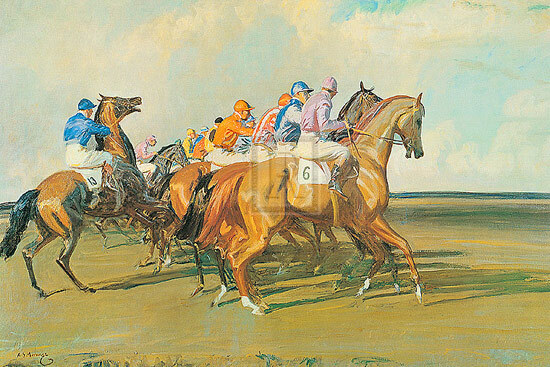 Under Starters Orders, by Sir Alfred Munnings. A film that explores the turbulent love triangle that surrounded one of Britain’s finest equestrian artists in his younger life is now in post production. “Summer in February” depicts artist Alfred Munnings’ turbulent love affair with his first wife, Florence, who developed a relationship with Munnings’ best friend, Captain Gilbert Evans. The love triangle ultimately led to her suicide. Florence is played by the Australian actress Emily Browning. Dominic Cooper stars as Munnings opposite Dan Stevens – who played Captain Matthew Crawley in Downton Abbey – as Evans. Jonathan Smith adapted his own 1995 novel for the film about the scandal that erupted in an Edwardian artists’ colony in Cornwall. Munnings was the leading equestrian artist of his generation. His work was collected by the Royal family and high society. He was a respectable figure in the 20th-century establishment, despite the scandal that ultimately surrounded his first marriage. The film is set between 1912 and 1914, when Munnings was in his early 30s. He was at the time a member of the Newlyn School, an artists’ colony in Cornwall, where he lived alongside fellow painters Dame Laura Knight and her husband, Harold. He met his wife-to-be at the colony. Florence Carter-Wood, 14 years younger than Munnings, had joined in the hopes of escaping her upper-class background. The troubled young woman, who fought depression, became Munnings’ lover. However, a relationship ultimately developed between Florence and Evans, a Boer War veteran and the manager of the Boskenna Estate in west Cornwall, where the colony was based. Florence married Munnings in 1912 but, it appears, quickly concluded she had married the wrong man. The film, based on Evans’ diaries, shows Munnings as a wild and passionate artist, and Evans as a respectable gentleman. Eight years after his first marriage, Munnings married well-known rider Violet McBride. They remained together until his death in 1959 at 80. Munnings said nothing in his three-volume memoirs about his first marriage. The producers of the film are are Pippa Cross and Janette Day for Crossday Productions, with Jeremy Cowdrey for Apart Films and Dan Stevens for Marwood Pictures. The executive producers are Bruno Wu and Stephen Henderson. A scene from Summer in February.